By The Acushnet Process Co. Dated 7-42. Large size. This is the first pattern A-10 with the unique and distinctive integral forehead strap running from the body of the mask between the eyes and up towards the top of the head. It also had enlarged 'cheek' pieces covering more of the wearer's face thus providing greater protection. The overall appearance is very good and the rubber is reasonably clean. There is no cracking or damage, the rubber is very supple, all harness mount lugs are complete and the unique forehead strap remains in place. The oxygen tube has some deformation near the top but is otherwise very good and supple. The webbing harness is clean and the metal componants are free of tarnishing or rust. 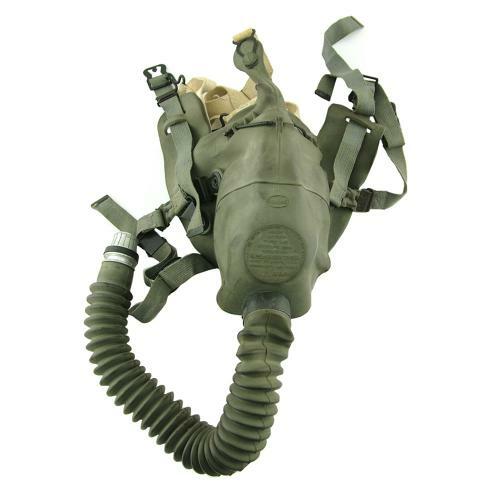 These early production masks were only made for a limited time soon being replaced by the A-10C (C = Converted, basically modified A-10 production masks with the unique strap removed) and later the A-10R (Revised) produced with a smaller facepiece and no strap at all. Also comes with a webbing 'Juliet' harness to enable use without a flying helmet. This is undoubtedly one of the rarest AAF masks to find. A very good used example. Stock code O22901.